Most of all, I think that the message of the entire series is that in order to love other people, sometimes you must first learn to love yourself. Your bio on your website says your interest in history inspired your world building in the novel. Which event would you say laid the most groundwork for your story? That depends on what part of the story you're talking about. I've spoken quite a bit about the influence that the glassblowers of Murano and Leonardo da Vinci had on The Universal Mirror; however, another event that had a significant impact was reading about the Burke and Hare murders. During the early 1800s, finding cadavers for medical studies was nearly impossible and so, in British schools (and likely others), it was common practice to purchase such subjects. The only legal supply was that of condemned criminals—in order to study medicine, it became necessary to look to more illegitimate suppliers to get bodies. (Sound familiar, readers?) In short, Burke and Hare were two men who took to murder in order to make money by supplying medical schools with corpses. Mirror definitely discusses the ethics around practicing medicine on subjects and whether or not it's morally correct to do so. A large amount of those arguments came from my thoughts about this piece of history. What sort of research did you do for The Universal Mirror? I did a lot of reading. Watching documentaries. Looking at pictures of artifacts and visiting museums. Talking to people. Cooking historic recipes (though I've done more of that for the sequel). The Universal Mirror isn't as martial as the sequel, The Jealousy Glass, so I didn't spend as much time researching weaponry or fighting technique as I've had to do for the latter. The Jealousy Glass, however, has been heavily influenced by my master's thesis which was on the Byzantine military so that's a little like cheating. :-) I've already done some of the work. What was the most interesting thing that you found or learned while you were working on your book? It's hard to pick just one! The Burke and Hare murders were something that I hadn't been aware of at all until I started reading about historic medicine. To be honest, I can't recall what path led me that far. Of that story, however, the fact that it was only condemned criminals whose bodies were given to research still fascinates me. It reminds me, in fact, of the Chinese "Bodies" exhibition that was rumored to have the same backstory—with criminals on display to explain the working of the human body. It's a second punishment to disregard a criminal's body or their intentions/desires for the treatment of their body after they have died. I'm still not entirely sure how I feel about that. When do you usually do your writing? Between the hours of 9 pm and 2 am, after my children are in bed and I can hear the clock ticking. On occasion, I grab snatches here and there on my lunch hour or in a quiet moment but overall, I don't normally write until after dark. Is there any book or author who inspired you to pursue your dream of writing? I'm fortunate in that I've met many, many wonderful authors who are kind and supportive. It would be hard for me to single out just one who has particularly inspired me, especially because I take my inspiration from everywhere. My children, perhaps, inspire me the most. I like to write stories about imperfect characters who do the best that they can in an imperfect world because I want them to understand that all people are worthy of love. And to give them heroes who are not beautiful nor necessarily incredibly talented—to show them that everyone is capable of being a hero, whether they're a handsome swordfighter or a clumsy dock worker. If you could choose one book – other than your own – for everyone to read, what would it be? The Brothers K by David James Duncan. Large portions of it are set in my beloved home state of Washington. It's about family, religion, and love. It manages to crack me up every time I read it and there are moments in the book that still make me cry when I read the words. Opening the cover is like returning home to a beloved friend. A lot of nonfiction—Chemistry for Nonchemists, Deadly Glow, etc. And yes, there's a reason for that although I think the librarians might be a bit afraid of me with all of these books I keep checking out. I have two projects in the works. The Jealousy Glass, the sequel to The Universal Mirror will be released this November. I'm working on a third book to follow, tentatively called The Oracle Bones. I say tentatively because I'm not in love with the title. If anyone has any good suggestions, I'd love to hear them. I'm writing another novel with Wilson Fabián Saravia, a brilliant conceptualist and artist who lives in Argentina. It's quite unlike anything I've ever even imagined before. Our minds are dreaming up a world that will surprise and amaze a lot of people but I'm keeping the finer details shrouded in secrecy for the time being. Write daily. They say it takes 30 days to make a habit stick so I'd recommend just trying it for that amount of time. It seems a lot more accomplishable than thinking of writing daily for a year. That said, if you're anything like me, after you've fought for that writing time every day for a month, you'll find that it's just so ingrained that you don't want to stop. Another thing about writing is just to remember that writing itself is a victory. Don't beat yourself up over what you write or whether it's "good enough." It's too easy to fall in the trap of self-critique and prevent one's self from writing. The harder thing is to remember that just putting the words down on the page is an accomplishment in the first place. Gwen, it was such a pleasure interviewing you! 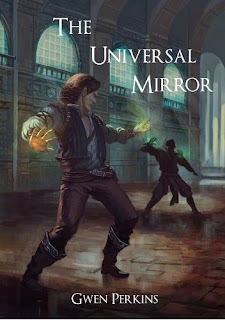 I can't wait to read The Universal Mirror and find out more about the Artifacts of Empire series! She lives in the City of Destiny (better known as Tacoma, Washington) with her partner, Laura, and their three children, Amaranth, Nynaeve, and Oisin. When she's not writing, she spends her days combing archives and chasing children…all in the name of history! Her hobbies include baking pies (sometimes referred to by others as attempted arson) and lampworking, or creating glass beads. These two things are not related. In between all of this, Gwen has written two novels in the Artifacts of Empire series: The Universal Mirror and The Jealousy Glass. The latter will be released in November 2012. 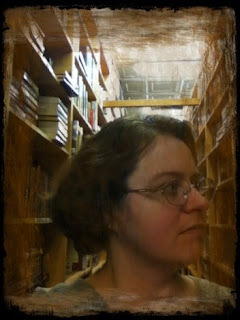 You can keep up with Gwen and the Artifacts of Empire series on her Website, Facebook, Twitter, and Google+. Wonderful interview, Kayla! I didn't know it takes 30 days for a habit to stick. Maybe that is why there are so many blog-a-days going around.